any tree or shrub of the genus Quercus of the family Fagaceae (beech family). This complex genus includes as many as 600, found chiefly in north temperate zones and also in Polynesia. The more southerly species, ranging into the tropics, are usually evergreen. The nut of the oak tree, usually surrounded at the base by a woody involucre. 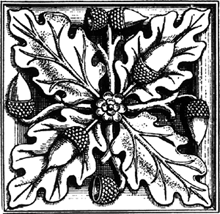 A small ornament in the shape of a nut of the oak tree; sometimes used as a finial, pendant, or decorative element within a broken pediment, or as a decoration on a carved panel.